A re-rated update to the NBA 2K12 roster failed to appease America's feverish Linsanity—the phenomenon surrounding the New York Knicks' Jeremy Lin—and so a second update, giving the point guard even more of a boost, is due by the end of the week. Lin, who went from the end of the bench to leading a desperate Knicks squad to six straight victories, rose from an overall 56 rating to a 69 in a "Living Roster" update that arrived early this morning. Even with a rare 13-point overall increase, a 69 (the scale goes to 99) is indeed unremarkable, and neither captures Lin's importance to the Knick offense nor his ability to influence games. Lin outscored Kobe Bryant with 38 points to defeat the Lakers on Friday and then, despite a poor shooting performance, drained a game-winning three-point shot yesterday to down Toronto 90-87. 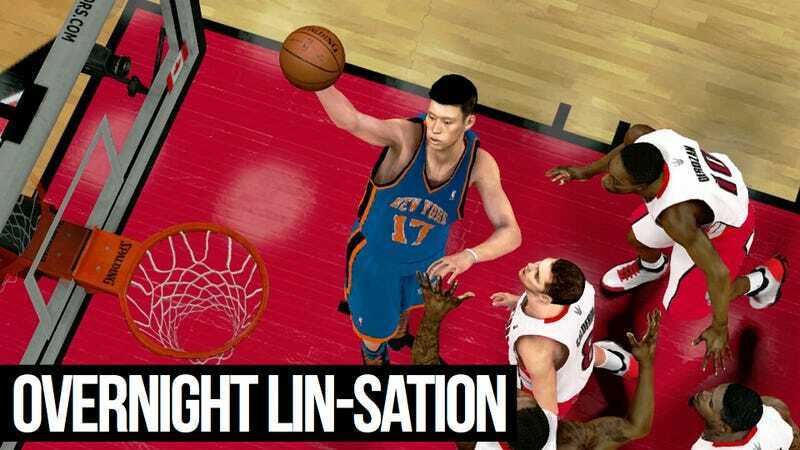 The video game still leaves Lin as a nonfactor. This morning I ran a background simulation inside the game's Association mode, using the re-rated Lin and both teams' starting lineups, setting all performers' minutes played to what they logged last night. Toronto blew out New York as Lin scored 11 points on 3-for-13 shooting and had six assists. In a live CPU-on-CPU game of 12-minute quarters, it came out more reasonably, though Lin had 16 points and 6 assists, not at all as remarkable as his six-game outburst. Sports video game designers don't want to go overboard re-rating players based on what is a statistically small sample size. But they also want to create something that appeals to the current interest in the league, and Lin is by far the No. 1 sports story in the United States. It's in 2K's interest to get Lin another boost for a couple of reasons. One is that a more dynamic Knicks team is a more popular online choice, and NBA 2K, like any sports video game, battles against the problem of seeing players choosing from the same three or four teams in quick matches. Another is because the pre-game broadcast packages usually involve the game's top-rated star. While that remains Amar'e Stoudemire (and probably Carmelo Anthony, when he returns from injury) fans are looking for Lin in these virtual games as much as they are on the television.